September 10, 2015 – The raging blaze is devastating pristine hectares of tropical forests and precious peatlands, orangutans are fleeing the inferno, particulate matter are soaring to unbearable levels while palm oil agribusinesses are rubbing their hands together in glee. Does this grim picture look familiar to you? You might have already guessed which country I am referring to, but most importantly, you might wonder what the concept of “sustainable intensification” really mean and what it has to do with deforestation in Indonesia. 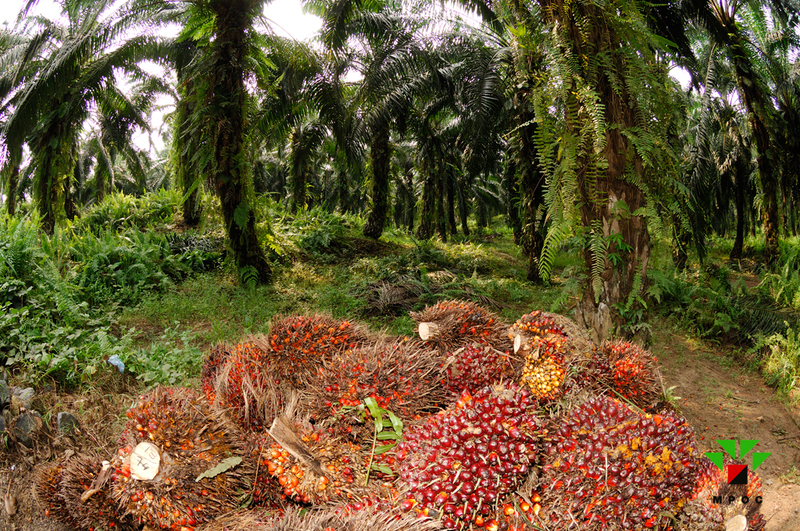 It could seem like an oxymoron at first glance, but its potential in contributing to sustainable food systems and in enhancing the wellbeing of poor smallholders’ households will be explored in the particular context of small palm-oil farms in rural Indonesia. To put it bluntly, sustainable intensification aims to raise agricultural productivity while safeguarding the environment; it is a controversial term that relates somehow to the idea of land sparing, where reserves of biodiversity are neighboring intensified agricultural land-use. Although theoretically sound, we seldom observe experimental successes, so why would we promote such an idealistic vision? First and foremost, it is essential to understand that sustainable intensification ought to be seen as a context reliant climate adaptation strategy that is independent of the need to grow more food (i.e. increasing volume of production). Let me guide you through the eyes of bona fide smallholders, whose livelihoods depend critically on their 2 hectares of palm-oil plantations. Discovered a few centuries ago in the West African’s tropical landscapes, palm-oil was brought in by the Dutch at the end of the 19th century. Not until the 1970s have we witnessed an exponential encroachment of oil palm trees into the Indonesian agricultural matrix, associated with rampant rates of deforestation (which reached a staggering 47,600 ha per year since 2000) and pervasive environmental degradation that threaten the genetic biodiversity of the Indonesia’s tropical rainforest. Global agribusinesses have put a substantial strain on the pristine natural capital of the archipelago, instrumentalizing small family farms in order to free space for agriculture and benefit from economies of scale. The current situation is dramatic, to say the least; but why independent smallholders (i.e. types of smallholders who manage and develop their plantations by themselves), whom we would think of as custodians of the environment, are conspicuously stuck into a vicious cycle that we could interpret as a natural resources degrading poverty trap? Indeed, due to pervasive low yields, smallholders appear unable to financially sustain their livelihoods, thus propagating incentives to slash-and-burn additional areas of the neighboring pristine forests, wherein they usually (and by “they” I mean the women) tap non-financial resources such as medicinal herbs and fuelwood for instance. Specifically, threats can range from land miniaturization to distorted marketing chains, wherein the latter can be illustrated via situations of arbitrage, where local traders of fresh fruit bunches (the raw “crude palm oil” processing material that smallholders are dislodging from the oil palm tree) are taking advantage of smallholders by buying fresh fruit bunches at a lower price than they will be sold at the nearest mill. Of course, farmers could also sell their raw material directly to the mill, but it is crucial to keep in mind that the freshness and thereby quality of those fruits usually deteriorates within the next 48 hours following its harvest. With poor local infrastructure, notably roads, and lack of appropriate modes of transport, the effort of doing so is simply not worth it, and smallholders end up relying on informal local services offered by the so-called “middlemen” (providing informal loans, selling fertilizer et cetera). When compared to “dependent” smallholders, i.e. tied with a private or state-owned company which manages a large portion of land developed by a community of farmers (palm oil business model commonly referred as a “plasma scheme”); independent smallholders can be seen as remote from formal markets, while lacking access to economic and agronomic knowledge that would contribute to an improvement in their yields and overall quality of life. Inexorably, they are falling prey to economic exploitation and unsustainable incentives, exacerbating deforestation concerns across the archipelago. Producing around 40% of the total palm oil output, smallholders in Indonesia are playing a pivotal role in the agricultural matrix, and yet their distress is still not clearly understood by government officials. After a recent field trip in an outlying rural community near Medan, located on the northern coast of Sumatra, we realized that a majority of smallholders was undoubtedly concerned about the future of their children, low quality agricultural inputs and poor access to health care. Consequently, would that simply mean that the smallholder farming system is doomed to fail, or is there a way out implementing strategic decisions that would promote environmental consciousness? Revamp the market and institutional structure surrounding smallholders, promoting better social capital between producers and buyers of fresh fruit bunches. Raphaël’s interest in environmental awareness and global affairs sprung from his fascination with the biodiversity of the Swiss Alps. His Bachelor in Economics strengthened his belief that nature is closely interlocked with economics, and could notably help to discern quantitative approaches to fossil fuels and deforestation while emphasizing the idea of a “green economy”. By convincing governments, NGOs, and international institutions to foster their actions and strategies in a sustainable manner, we might ensure future generations have equal access to natural wealth. He believes today’s young leaders could be the new catalysts of a substantial shift in the near future.